This pack provides a complete worship resource for yourself or your church - at an amazing price. The best worship songs from 1999, 2000 and 2001 are included, from artists like Darlene Zschech, Delirious, Don Moen, Matt Redman, Paul Baloche, Sonic Flood, Reuben Morgan and many others. 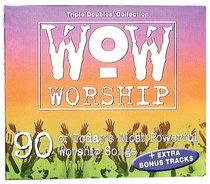 About "Wow Worship Triple Double Pack"